Economic bellwether Fedex reported earnings ahead of analyst expectations for their third fiscal quarter ending February 28th, raised their full year forward earnings guidance, and then spoke of a broadening recovery on their analyst conference call. NEW YORK (AP) — FedEx says the global economic recovery is broadening, as Asia continues to see strong growth and the U.S. economy gains steam. Fred Smith, CEO of the world’s second-largest package delivery company, said U.S. growth is being led by a strengthening manufacturing sector. FedEx is predicting gross domestic product growth of about 3 per cent for 2010, in line with the expectations of economists. The largely positive comments came after FedEx said that fiscal third-quarter profit more than doubled from a year earlier. It was the first year-over-year profit increase for the Memphis, Tenn., shipping company in five quarters. The company, considered an economic bellwether because of the variety of products it ships, said Thursday it earned $239 million, or 76 cents per share, compared with $97 million, or 31 cents per share a year earlier. Revenue rose 7 per cent to $8.70 billion. The results exceeded Wall Street expectations for earnings of 72 cents per share and revenue of $8.37 billion. The company said results were boosted by higher shipping volume, particularly at its international express and Ground units. Average daily volume in International Priority packages grew 18 per cent, led by exports from Asia. Average daily package volume at FedEx Ground grew 5 per cent, mostly due to businesses shipping more packages to other businesses. Better volume is a good sign for FedEx — and in turn, the economy — because it means consumers and businesses are shipping more goods. FedEx made more money per package mostly due to higher package weight — another positive economic sign. Cost cuts also boosted results. 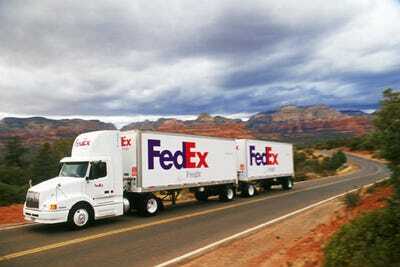 But the results also show that large transportation companies like FedEx continue to battle higher fuel costs. In addition, a loss at the company’s freight unit and partial reinstatement of some employee benefits the company had taken away during the recession damped results. For the fourth-quarter, FedEx expects earnings per share of $1.17 to $1.37, compared with analysts’ prediction of $1.26 per share. FedEx said reinstatement of more employee compensation programs will hurt earnings in that period as well as in the next fiscal year, which begins in June. UPS, the world’s largest shipping company, said last month that fourth-quarter earnings nearly tripled. Still, UPS said its freight business — which transports larger products like appliances and cars — continued to lose money. FedEx shares lost $2.52, or 2.8 per cent, to $87.28 in morning trading. But shares climbed more than $3 in the week before the earnings report.